In true Barbara fashion, I couldn't let my maternity leave finish up without some "excitement". 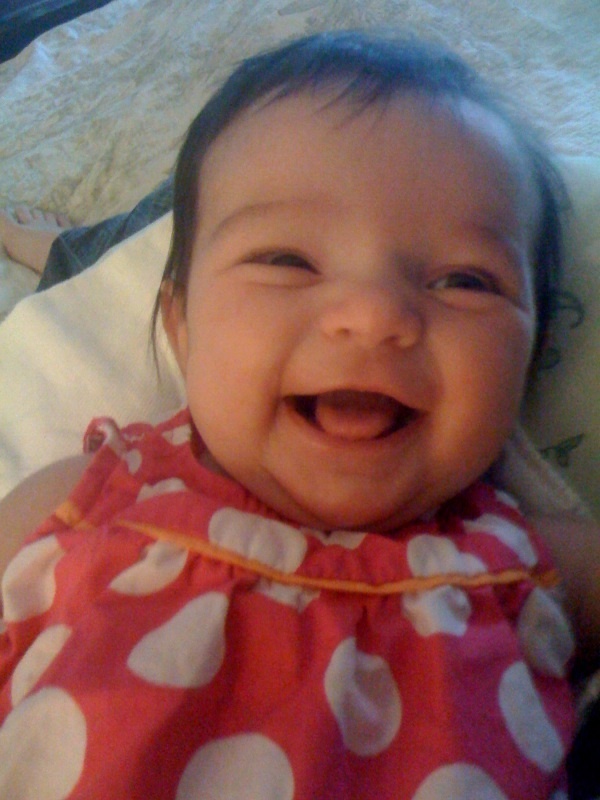 Last week I was going to take Kathryn out to run some errands. After getting her strapped into her car seat, I first made a trip out to my car to pack her diaper bag and some dry cleaning to be dropped off. I was about 5 feet from my car when I stepped onto a small uneven part of the ground, heard a pop, and fell straight to the ground. OUCH it was painful! THANKFULLY, Kathryn was patiently waiting for me inside and I wasn't holding her car seat or else she would have gone down with me. After laying there in extreme pain for a minute, I got myself up, very, very slowly. 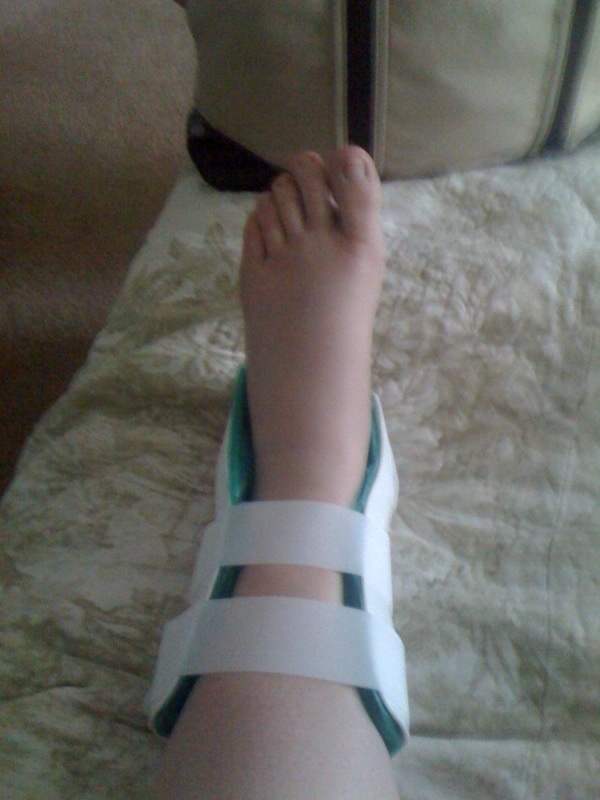 Since the swelling wasn't going down, I finally went to the doctor...4 days later (however I still ran my errands that day after an hour of resting!). 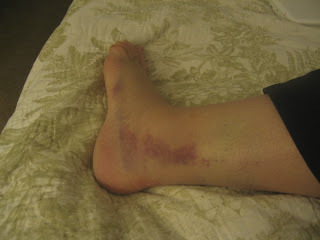 The doctor couldn't believe the swelling, but the good news was that I didn't break or fracture anything, instead I tore a ton of ligaments (hence the bruises all over my feet...see below for evidence!). So now I'm supposed to wear an air cast for a month to prevent me from re-injuring myself and to help with the sprain. My ankle feels much better after I've been carefully walking on it for a while, but the initial walking around is terrible, especially after sleeping all night! Just to compete with my injury, E.J. went to help his mom yesterday with one of her horses (the horse needed to be caught so it can be halter broken). Long story short, E.J. came home drenched in sweat with two painful looking welts on each of his legs after being kicked by the horse. Poor guy! They look incredibly painful, but they eventually did catch the horse! So last night we hobbled around and had a romantic Saturday evening watching a movie as we iced our wounds :). On a brighter note, I attempted a short walk with Kathryn because my ankle feels better after walking around it for a bit. 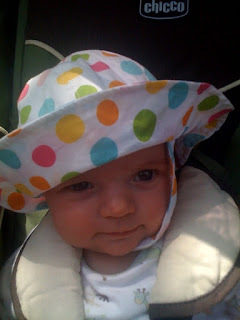 Here she is looking oh-so-cute in her sun hat. And of course, I had to end this post with her cute-as-can-be smile! Looking at this picture suddenly makes any pain I'm having, disappear.